The hallmark of a good monster movie is, of course, a great monster, as proven by the likes of The Blob, The Thing, and Attack of the Killer Tomatoes. The same goes for horror TV shows. And while the world of modern movie and TV monsters is crowded with CGI and digital animation, there are still some actors who take on the task of making the most grotesque and complicated creatures come to life. Would The Fly have been as emotionally poignant without Jeff Goldblum's grueling transformation? Would The Birds have been terrifying without the, well, birds? These movie and TV actors manage to embody their characters so well that you'd never recognize them in real life. We rarely get a glimpse of their actual selves (except a brief scene where the Night King was a living, breathing human), but, as it turns out, they're pretty attractive underneath all those layers of prosthetics and special effects makeup. 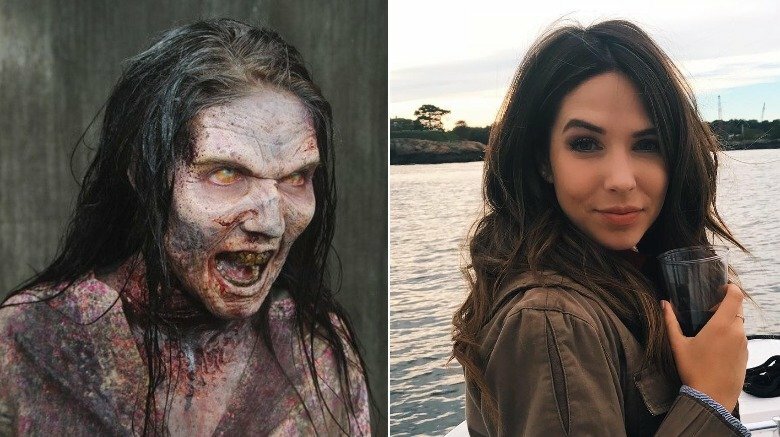 From Insidious' terrifying Bride in Black to the Netflix Robot that made the Internet swoon, these film and TV monsters are absolutely stunning in real life, inside and out. 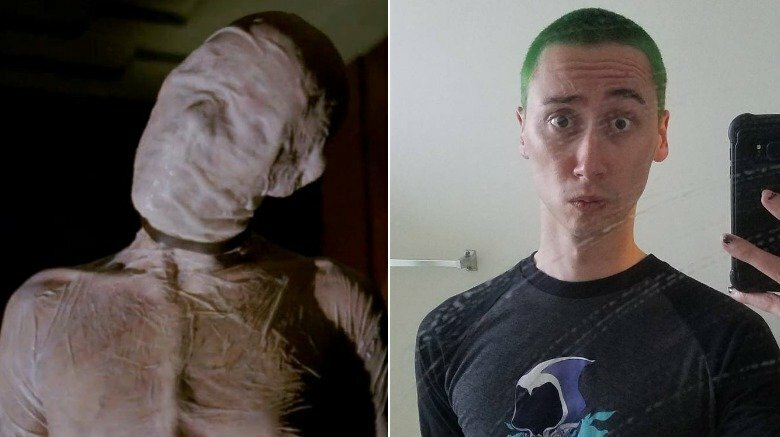 Alexander Ward may look normal in real life, but the actor has made a name for himself in Hollywood by "specializing in monster and creature characters," according to his Instagram bio. The star has appeared in series like Westworld, Teen Wolf and Sleepy Hollow, but what's arguably his most terrifying portrayal comes from the twisted mind of Ryan Murphy and the insides of a dirty, dank hotel mattress (which is really the last place any of us would ever want to think about). American Horror Story is known for its shock value, but the Addiction Demon from Hotel (season 5) might just be the worst offender. The demon — who's so NSFW that it feels gross even describing it — partook in what Murphy calls "the most disturbing scene we've ever done." Honestly, his description holds up. After the scene aired, it was slammed on the Internet. Vanity Fair claimed it wasn't "trash — it's garbage." Refinery29 said, "It's not provocative; it's stunt outrage, and kind of disrespectful to anyone who's actually battled a heroin problem (or survived sexual assault, for that matter)." If there's one evil character that embodies the Insidious series, it's the Bride in Black. The old woman, as she's referred to in the first flick, is dressed in a black wedding dress with stark white skin and dark eyes. In the latter chapters, she's revealed to be the parasitic ghost of a male serial killer who suffered years of familial abuse. If you couldn't have guessed, the man behind the bride isn't trying to steal your soul. He's actually played by an actor that used to be on a children's show. The star, Tom Fitzpatrick, had small roles in the Nickelodeon series iCarly and didn't even know what Insidious was when he booked the gig for the second and third films. In an interview with Terror Time, Fitzpatrick admitted he wasn't aware of the outlandish costume he'd be wearing when he first signed up. "After the call from my manager, I may have gotten a call from Wardrobe, which is standard practice, asking for my sizes," he said. "'Should I bring shoes,' I may have asked. 'Oh, don't worry,' I think they said, 'you're just gonna be wearing pajamas.'" If real, the Black Bride probably wouldn't even wear pajamas considering how she haunts people's dreams. Do you need sleep if you've been dead for decades? Wes Craven has always had a knack for creating dastardly creatures that bring our worst nightmares to life. Character Freddy Krueger did that literally. The slasher film star isn't just a villain. He's a horror institution with disturbing looks to match an equally messed-up backstory. The former janitor was burned alive which somehow transformed his mutilated corpse into a demon that could only kill his victims inside of their own dreams. 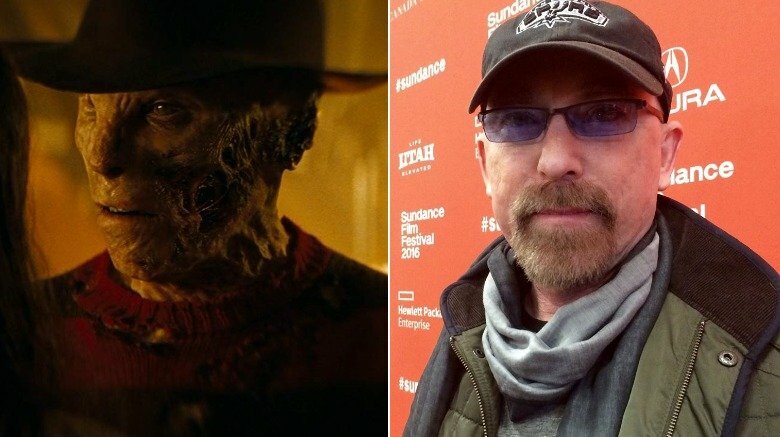 In 2010, the role of the infamous serial killer was taken on by Jackie Earle Haley for the Warner Bros. remake of A Nightmare on Elm Street. The Academy Award-nominated actor wasn't a fan of horror when he donned the famed razor glove, but he endured the arduous makeup process to take on the iconic role anyway. 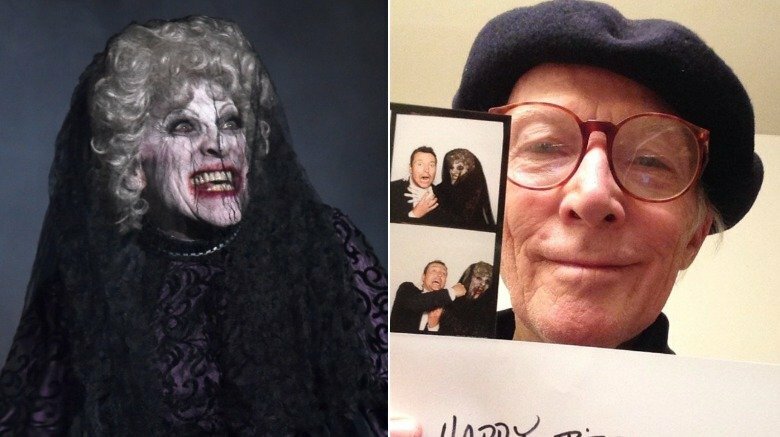 "You know, I've done a lot of complaining about the makeup, cause people are asking me that question," he told Bloody Disgusting. "But it was well worth it. There was even something just about the arduousness that really helped for the preparation for the character…yeah, it was a fun process. It was incredibly difficult, incredibly arduous, challenging, physically and just everything. But it was also fun getting in there and playing Freddy Krueger." There's a reason winter took so long to come. Apparently, actually becoming a White Walker takes some serious effort. In an interview with Vulture, Game of Thrones actor Kit Harington revealed his ghostly foes come to life without the use of CGI. 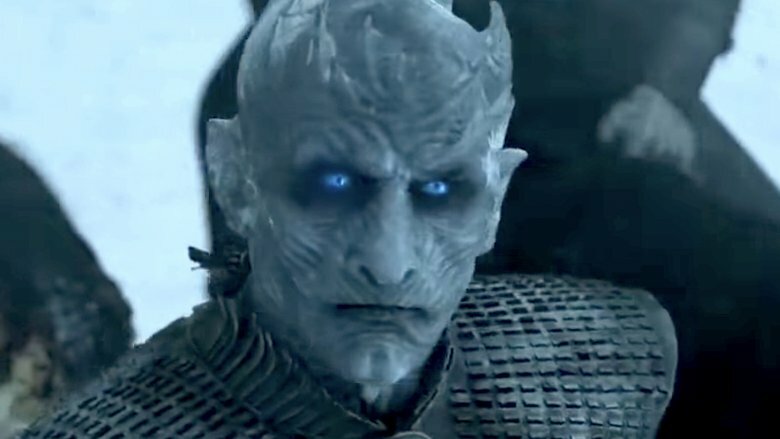 The Night King's crown of horns and ominous blue eyes are apparently prosthetics. 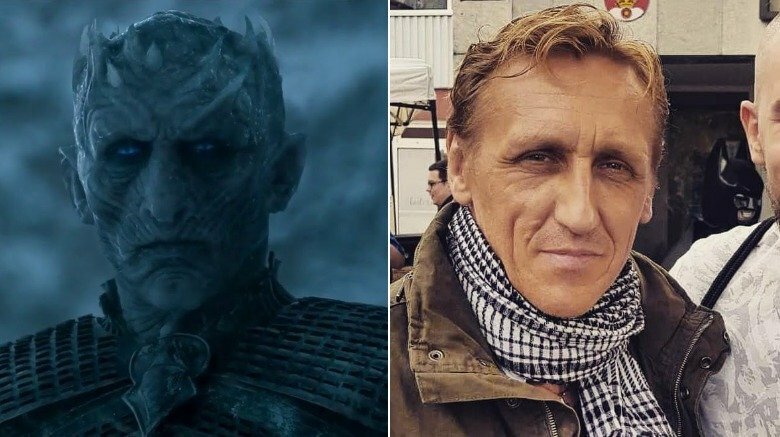 According to Times of India, it takes a whopping six hours in the makeup chair to transform stuntman-slash-actor Vladimir Furdik into the White Walkers' fearless leader. The transformation is so severe that fans rarely recognize him in real life, and he's shown without makeup in just a single episode over the course of the series. "Not many fans know I'm the Night King because on the show, this face is always behind the mask. It's at events when fans know it's me that they come for autographs and selfies," he told Times of India. Furdik, who replaced Richard Brake on Game of Thrones in season 6, started his career as a stuntman in films like Skyfall and Thor: The Dark World. The Walking Dead has some of the most gruesome special effects makeup on TV. What else would you expect from a world plagued by zombies? As reported by The Wall Street Journal, the series won an Emmy for outstanding prosthetic makeup in 2011. Its competition was insanely fierce and included Game of Thrones, whose terrifying White Walkers use prosthetics rather than CGI. Perhaps the most outstanding display of transforming a pretty woman into a terrifying monster is with Xan Angelovich. The model, who's signed to MMG Talent, played a "hero walker" in 2012 and 2013 (though her role is listed as an uncredited production assistant on IMDb). According to The Wall Street Journal, the actress got "full prosthetics," whereas background zombies usually wear masks or receive airbrushing. In an interview with Allure, executive producer-slash-makeup supervisor Greg Nicotero spoke about how they've basically got zombie transformations down to a science (that thankfully doesn't include an actual viral outbreak). "We have an assembly line of four artists that can finish 40 to 50 zombies in an hour," he said. "The first makeup artist shadows around the eyes and cheekbones, the next person does a lighter color over the highlights to accentuate the bone structure, the next person spatters blood, and then the last person puts conditioner in their hair." The Shape of Water ended up winning the Oscar for best picture largely because it managed to achieve making a giant, godly amphibian man into an actual sympathetic character. 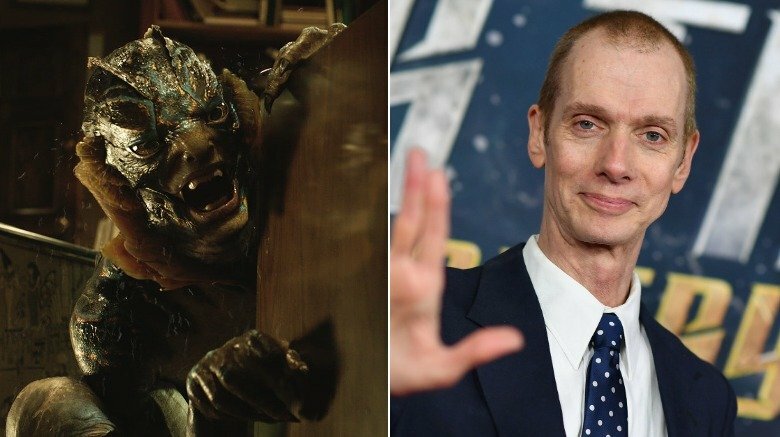 For Doug Jones, who donned the scaly suit, that was no easy task. The costume alone took three years to create from a drawing in Guillermo del Toro's sketchbook. Once Jones put it on, it was exceedingly difficult to see, hear, and feel. In an interview with Wired, he admitted it left him feeling like "a bit of a nursing home patient." Jones, who doesn't actually have any speaking lines, told Slate that his role was unlike most of his other costumed roles. Instead of spending hours in the makeup chair, it was relatively easy to put on but posed a major problem when it came to using the bathroom. "There was no trapdoor in the back," he told Slate, adding, "When I'm in the suit, it'll be for a good 16, 17 hours a day. So you have to make sure that you're not going to have a little accident. And that is my biggest fear in this world is that they're going to pull the suit off me one day and be disgusted by the aroma." 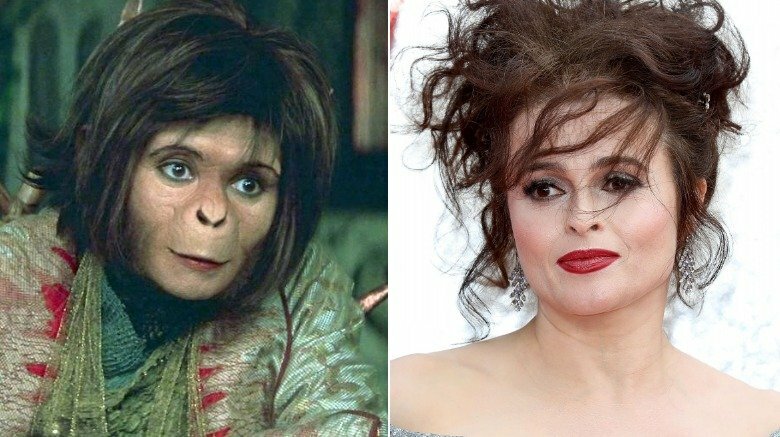 Tim Burton cast Helena Bonham Carter in his 2001 Planet of the Apes remake. The actress, who separated from the director in 2014 after a 13-year relationship (via Vanity Fair), has often been described as being Burton's "muse." And it might have just been her portrayal of the chimpanzee humanoid Ari that sparked their longtime working relationship. Burton and Bonham Carter first met on the set of the classic remake, in which the star underwent what she called a "cumbersome and crippling" makeover. In an interview with Cinema.com, Bonham Carter admitted it took about four hours in the makeup chair to fully get dressed in her "very unpleasant" and "unbearably hot" chimpanzee costume. It was difficult to hear wearing the rubber ears, and her furry hands were "absolutely useless" (especially if she needed to scratch an itch). The huge teeth also posed a problem. She could only drink through a straw and was forced to use a tiny cosmetic mirror to eat just so she could see where her mouth was, but the worst part was using the bathroom. "That was a huge event in itself and very exhausting," she said. "It meant removing your rubber furry hands and then struggling to open your ape suit, so basically we ate and drank as little as possible simply to avoid the incredible logistical problems of going to the toilet." 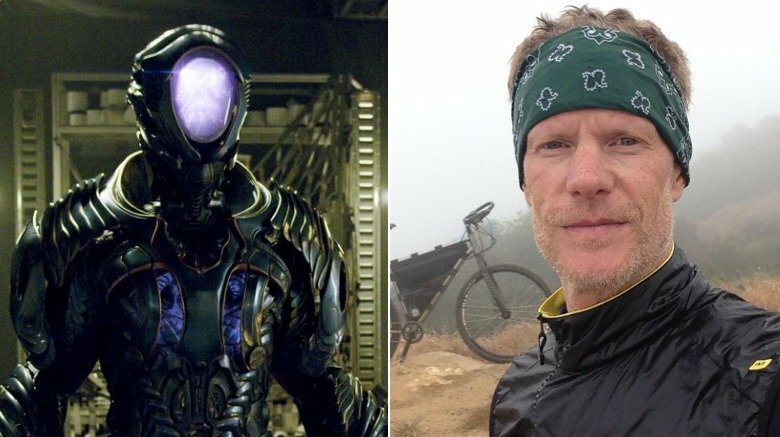 In Netflix's reboot of Lost in Space, the iconic role of the Robot was absolutely transformed. In many ways, his complexity and depth are the reasons the show is so captivating. Though there's undoubtedly parts of the upgraded costume that can be attributed to CGI (hello, multiple limbs), the main, humanoid portrayal is done by actor Brian Steele, who wears a heavy robot suit throughout filming. The Robot's face obviously looks nothing like Steele in real life. While Steele can rely on human things like eyebrows and lips to express emotions, the Robot only has his color-changing face, which evolved throughout the production. "It started out colorful but it was distracting," VFX supervisor Jabbar Raisani told IndieWire. "We decided to go with a lava lamp sense where he was a bit more ethereal and almost more mesmerizing as you stared into his face. And then using slower patterns and light seemed to be more effective. But we tried to use color to help show what he was feeling." According to an interview in Popular Mechanics, the entire idea for the sci-fi horror Splice was sparked by the real-life image of a lab rat with a human ear growing out of its back. Basically, it was always going to have creepy, genetically mutated creatures from the get-go. Director Vincenzo Natali even worked with a real geneticist while writing the script to make sure things were as realistic as possible. Sure, we may not be growing a Dren in the lab anytime soon (especially because the ethics are questionable at best), but what about in the future? For something so bizarre-looking, Dren is actually kind of beautiful — as much as a humanoid with a tail, wings, and triple-jointed legs can be. That's largely due to actress Delphine Chanéac's stunning good looks, and the fact that it took more than a decade to flesh out. Natali used designers who came from a fine arts background rather than a film background to create a more realistic movie monster. "What I wanted to do with Dren, in her later stages, was to change the human form in subtle ways," he told Popular Mechanics. "I felt the small changes would actually be more shocking than the big ones. If you make a small change to somebody's face, it is much more jarring than some kind of gross deformation." Silent Hill is certainly a creepy video game series, but the movie's real-life scare factor hinged on transforming the intense cast of monsters into actual living, breathing beings. Its success would not have been possible without award-winning choreographer Roberto Campanella, who's worked on film and TV projects like The Shape of Water and The Strain (via Broadway World). 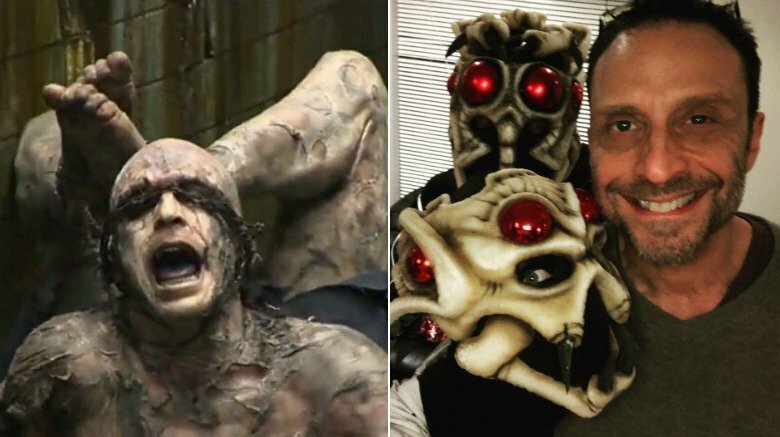 For Silent Hill, he not only served as creature movement coordinator (an actual professional title), but he is also credited as Colin and Red Pyramid. Though Campanella is an undeniably attractive dancer, Colin was absolutely grotesque. The character was meant to be a former janitor who was tormented by Alessa after sexually assaulting her. She ultimately killed him and tied him up with barbed wire in the bathroom stall where the attack took place. There wasn't a whole lot Campanella could do choreography-wise to make the character more grotesque considering he was bound in the costume, but he did improvise with facial expressions. "My head is tilted back, so I can't even really move my head that much," he said in an interview. "The only thing that I could really use to make it obscene was my tongue." Obscene it was. 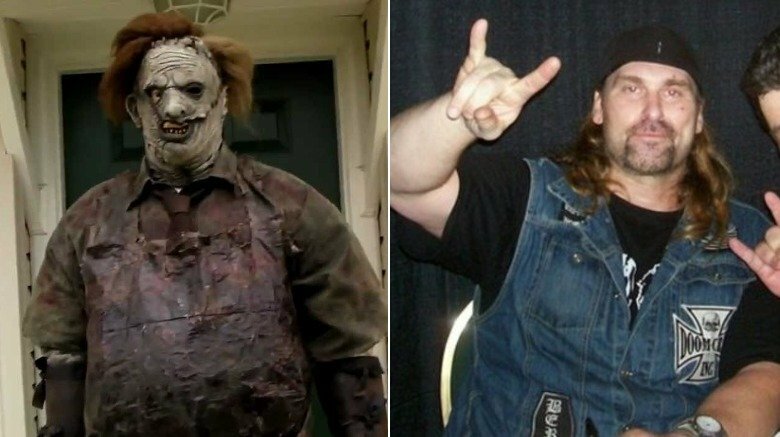 Andrew Bryniarski wasn't the first choice to play the iconic horror movie villain Leatherface in the 2003 remake of The Texas Chainsaw Massacre, but it was his beefiness that landed him the part. Director Marcus Nispel reportedly wanted the biggest guy. In an interview, the former professional bodybuilder admitted he only got the role after the person originally hired lied about his size and physical ability. "They hired the wrong guy, and then on day one, scene one, take one, he is hospitalized/disabled by the intensity of work and is fired," Bryniarski told Texaschainsawmassacre.net. "By now they needed help…and I was raring to roar. I was then asked if I could/would still like to fly to Austin. I told Marcus 'Don't worry, I'm your man. I was born to wear the mask!' I meant it. He knew it. That's that." Bryniarski might have been the right person for the part, but he certainly was nothing like his character. Dispelling any possible rumors to the contrary, Bryniarski insisted to IGN that he never stayed in character between takes. Rather, he'd run to his trailer and play guitar because he's a "rock and roll machine, not a killing machine." 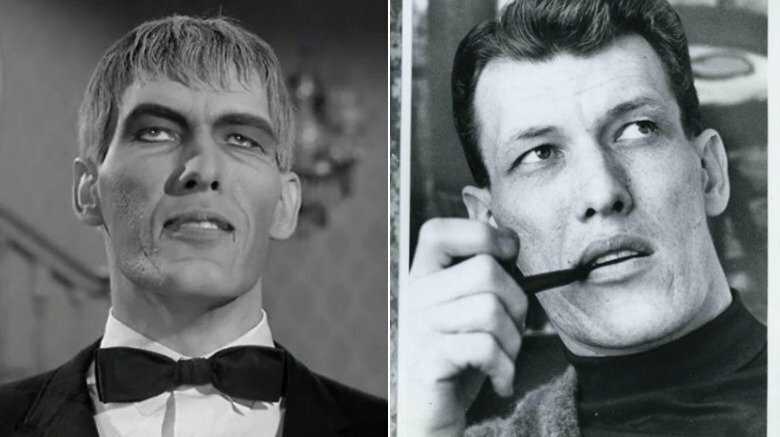 Ted Cassidy isn't exactly a household name in modern times, but his monster character in The Addams Family absolutely is, even if the original show only aired between 1964 and 1966. The former radio news reporter beat out more experienced actors for his role on the series because of his massive height. With Cassidy at six feet and nine inches tall, The New York Times called his large stature "the boon and bane of his existence." Lurch's appearance and monotone voice lent itself to the creepy, unsettling undertones that made The Addams Family such a cult hit. According to Legacy.com, the star wasn't meant to have any lines but ad-libbed the famed "You rang?" in his audition. Cassidy, who passed away in 1979, might have been tall, but he didn't look anywhere near as ghostly as his infamous character. The star also had roles in MacKenna's Gold and Butch Cassidy and the Sundance Kid, in which he dressed in Western garb and even sported a moustache (which he totally pulled off).